The Cinder Pup (pictured right) will be a reward from a follower mission, Fiery Friends. 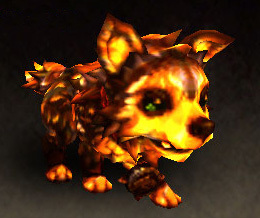 "A group of tiny fiery puppies was spotted deep within Blackrock Foundry. If we save them, we may be able to raise them." We hope the Cinder Pup will get along well with the Cinder Kitten! 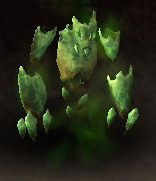 The second pet, Shard of Cyrukh (pictured left), will require a fair amount of questing in Tanaan Jungle before gaining access to the area in which the treasure spawns. According to Twitter user @Mononic1, the treasure containing the Shard of Cyrukh is located south-east of Throne of Kil'jaeden. Once this area is unlocked for you, keep an eye out for a glowing yellow crystal jutting out of the ground (pictured below). 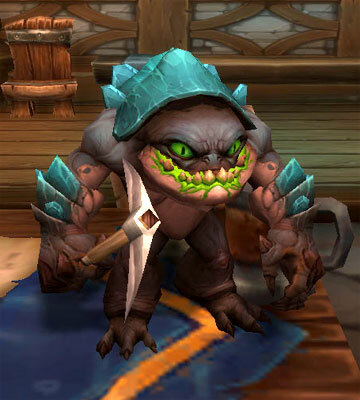 Crusher, a pet inspired by the ideas of a seven year old aspiring developer, was added to the PTR. This pet will be available from Trader Araanda (A) and Trader Darakk (H), found inside the Town Hall in your garrison. Crusher will cost 1000 gold and is Bind on Use. True to the boy's original concept art, Crusher wields a little pickaxe when summoned out (pictured right). I'm so excited for the cinder pup and this lefty shark, but WOW, WoW! putting in Crusher is SOOO beyond awesome! I will be buying that one ASAP! Hope that kid follows his dreams and goes far! Omg... Cinder Pup looks sooo cute! Now I really can't wait for 6.2. So many new pets and mounts :) Almost got enough charms saved for all the pets and toys the new vendor will be selling too. I'll take one of each please!!!! SO EXCITED!!! Also saving up my charms! I wish I had an Ore Eater to go with Crusher. Awww, I was hoping Crusher would look more like the little boy's picture. Where are the spikes on his back? The cinder pup is awesome. A good complement to the Molten Korgi. I totally love it when Blizz does soemthing like the new pet the budding blizzard designer penciled out. Just imagine the look on this kids face when he sees it. Hooray for Crusher!! So cool that they added that pet in. The super adorable conversation that started it all can be found here, and here.